Ocean Miracle Says it All - BLIND FAITH LIVEBLIND FAITH LIVE ! Real People. Real Miracles. Kathy Nemeh thought that she was going to live a normal doctor’s wife existence. Then, she watched an ocean miracle. Kathy’s husband swam out into the ocean to find his lost glasses. Is that normal? When Dr. Issam Nemeh dove down into deep murky water and then ascended to the surface waving his glasses, Kathy knew that life was never going to be normal. Every day, Dr. Issam Nemeh prays for people. Every day, things happen. Miracles happen. Is that normal? 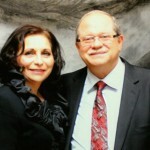 In this episode, Sue Chillemi tells us that the greatest blessing she has ever received from God is when she got sick. Is that normal? Heather Light, my former radio producer, never prayed and never went to church. All of that changed when a handsome stranger sat down at her dinner table. Is that normal? There is nothing normal about God. You can’t put him in a box. He is the God of surprises. Always loving and directing us to his son. This entry was posted in Dr. Issam Nemeh, Kathy Nemeh, Miracle Moments and tagged Lungs by Philip Keller. Bookmark the permalink.